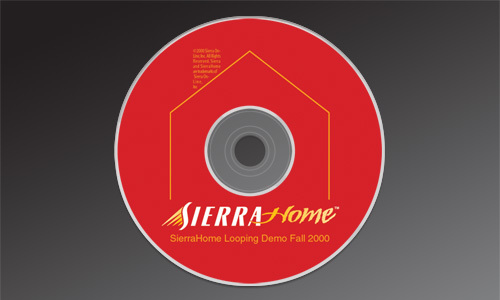 I was so anxious to get “a job” that I had neglected to figure out what Sierra On-Line, Inc. actually did. It wasn’t until about the end of my first week that I realized that they were in the video game business. Moreover, they were quite hot at the time. 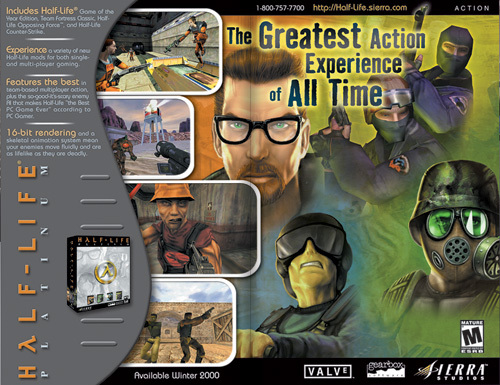 Their “first-person-shooter” game, Half-Life, was a blockbuster on the cutting edge of social networking, the mercury of a feverish rash of global online tournaments. This star was orbited by a constellation of other shining titles (so, obviously, I was not a “gamer”). 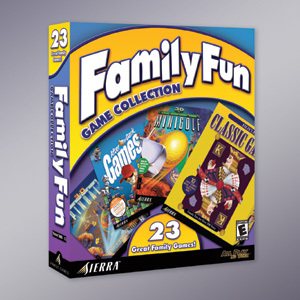 Somewhat strangely, they also made similarly successful home-improvement and family-oriented software under the Sierra Home banner (so, obviously, I was not a dad, either). It was another week or so before I figured out what I was doing there. I had started designing within my first hour, but I was in a bit of disbelief that I was actually getting paid for my tasks. My very first project was to create a two-inch round sticker for a software package that said something like “15% Off When You Buy Two!” with a long line of legal copy run around the perimeter. Talk about sticker-shock! Had I really gone from taking weeks to conceptualize, design, and produce posters for famous architects and such to churning out impulse-buy marketing decals (technically referred to as “violators”)?! Well, yes, but there was more to it than just that. For one thing, someone had to make those stickers, I guess, so why not me? (I needed the money, after all). And I would get my chances with more diverse, complex, and important pieces down the line. And for all of my cockiness, I still used a stupid typeface and didn’t kern the 1 and the 5 properly until my creative director told me so. 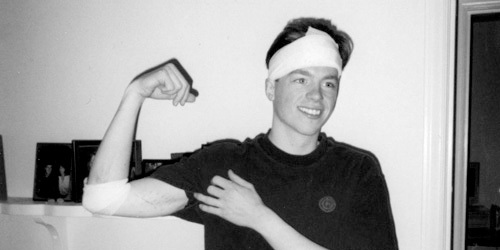 This was obviously before 9/11. Print Artist was Sierra’s graphic design program. Somehow, Adobe survived. Discouraged? Frustrated? Then you probably shouldn’t be getting married. The diagonal stripes are in reference to all the construction that users of this software would be doing to their homes. 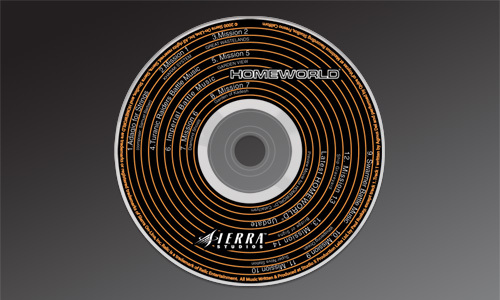 This was actually a soundtrack that went along with the game Homeworld, so I tried making it look like a record and/or a speaker driver. The game had something to do with outer space, so the rings could also be read as orbits. Pretty exciting stuff. Hopefully, some family had fun. I did design a Flash animation for the logo, however, which you can see by clicking on it or here. For one reason or another, doing this animation was one of the few things I felt compelled to do on my own, without anyone asking me. And, as such, nobody ever used it. 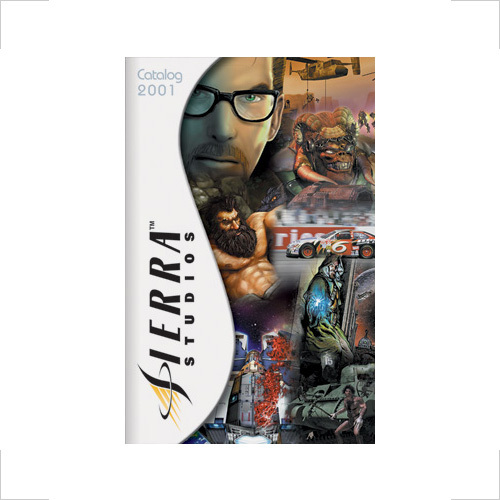 One thing that I actually designed from start to finish was the 2001 Sierra Studios Catalog, a showcase of Sierra’s prime new offerings in a 16-page glossy, to be shipped with every Sierra game. I created the S-form device (based on the exact curve of the Sierra master logo’s S) as a unique framing device for the action-packed illustrations and a container for titling and information. 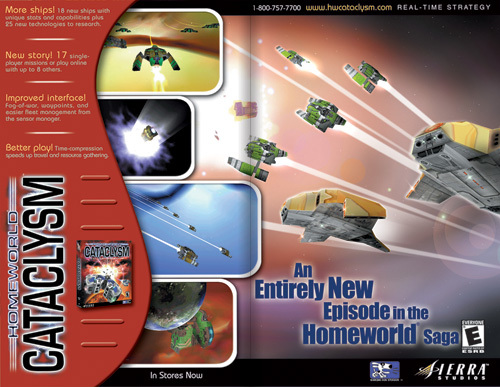 2001 Sierra Studios Catalog (cover); 9in. x 12in. ; 16ppg. + cover, saddle-stitched. I still didn’t quite get the whole “kerning” thing by this point. I had a lot invested in this project. Just in terms of time, this thing took forever to build. I had developed a number of concepts and nailed down the final format within a week, but, like many projects at Sierra, I created the working files for the entire layout of each page / spread in Photoshop. For those of you who have been on Pluto for the last ten to fifteen years and haven’t heard the buzz about Photoshop, it’s the whiz-bang fake-it-all-and-then-some miracle-worker, hailed as the essential design program by hacks and soccer-moms worldwide. Don’t get me wrong; Photoshop is a perfectly useful program for certain things (like, say, working on photos), but it should probably never be used to create any kind of comprehensive print mechanical. One reason for this is that the way it works with images creates immensely huge files that require almost as much processor power to work on as a Microsoft Word document (that’s a joke for all my friends over there in Redmond). Creating these massive, print-resolution files so taxed my then-state-of-the-art Mac G3 that I could—and did—put my feet up on my desk and read through bike magazine articles while the program whirred away at things like moving a block of type over three points. On inside spreads, drawers of screen shots slid out from the “S” device. Despite questionable file preparation and iffy work ethic, I had created what was potentially one of the most valuable communication pieces for the company, on time and on budget. 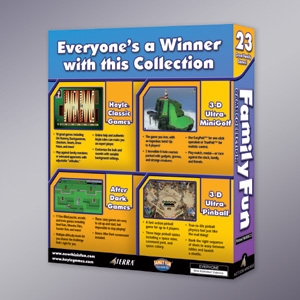 I was pretty happy with how the brochure shaped up, and so were the rest of the involved parties. 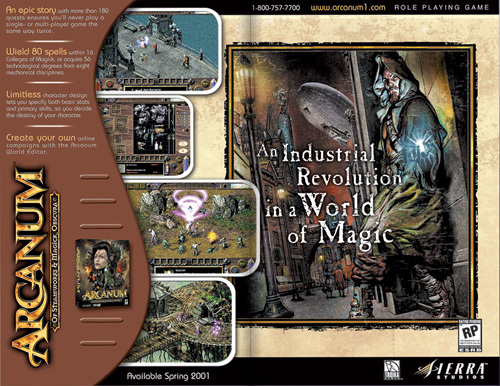 Anyone familiar with my general approach and sensibility about design may be a little surprised that I ever did anything like this, but I still think that it was a very appropriate solution and the target audience would have eaten it up with a spoon. I say “would have” because the target audience never saw the brochure. Just after I had handed over final files to be printed, it came to light that there were two groups within the company that were involved in commissioning the piece and each thought it was coming out of the other group’s budget. Neither group actually had the money, so the project was killed. Many of my colleagues were passionate about their positions, and it showed in their work. 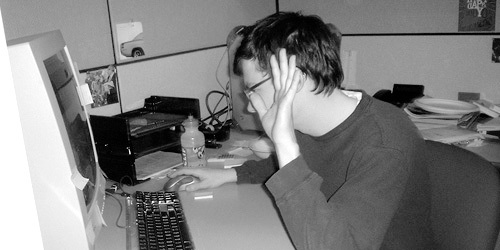 After all, it was a bona-fide “dream job” (you were required to play video games at the office for crying out loud). And of course I gained much from the experience. At the base level, my income range was, while nothing to sing about, decent; I was able to buy a car and live in a house (not my own, but I paid my fair share every month). Technically, I learned a ton about efficient organization and production—and a little bit about design. I got to work and hang out with a lot of really talented people (who also knew how to have a good time outside the office) that I never would have met otherwise. And, despite the “fun” industry, I still got a taste of how the middle class squeezes into offices every day, with all of its bizarre socio-hierarchical walling, necessary rung-jockeying and inevitable line-crossing—a strange but valuable experience for any young pro. But it was never my dream. Without the paper or the real proof of education and with my slim portfolio, I was lucky to have a position in such a prominent organization, and I did my work fairly well. But the subject matter barely interested me at all, and any personal investment I made never seemed to pay much dividend. I didn’t have the sense that I could fulfill my potential, and I didn’t have a real zest for what I was doing. But I did have a job.